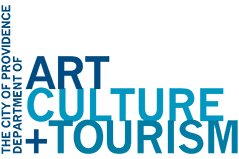 Turnaround Arts: Providence has come full circle this, having implemented the program with Providence Middle Schools for the entire 2017/2018 school year. 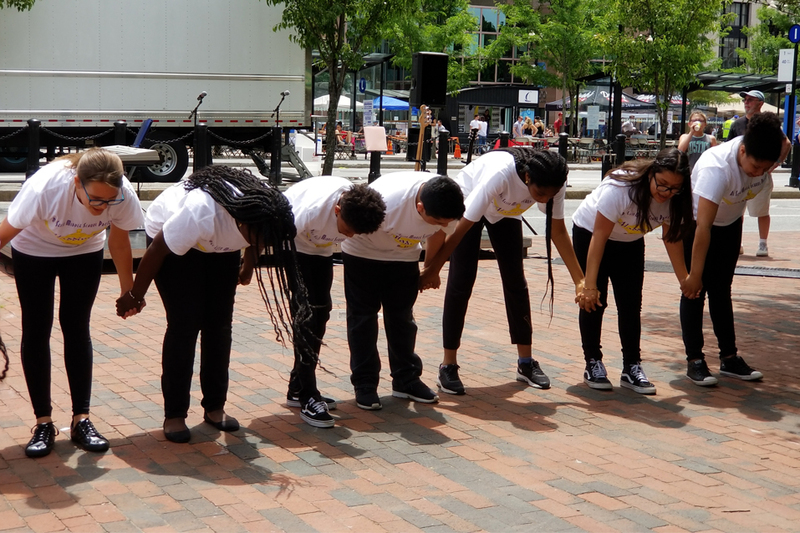 From performances in the schools to a grand showcase at PVDFest in front of over 100,000 spectators, we have begun to pave the yellow brick road to success. I interviewed two students, L and J, about the stained glass assignment (pictured above) that they completed in Mrs. Hartnett’s eight grade math class at Gilbert Stuart Middle School. I wanted to get more information about the assignment from the teacher, and she was willing to share. Mrs. Hartnett is committed to pushing her students’ learning through the arts; she doesn’t want to do arts for art’s sake only, but rather to see her students learn using arts as a vehicle. As a result, our conversation included a description of the stained glass assignment, as well as ideas on how to push the academic task further. When I began asking her where she got the idea, to my delight Mrs. Hartnett said she was inspired when a Turnaround Arts PD presented at her school. It inspired her to come up with a different approach to a lesson she had done previously. She wanted to “give it more art.” The assignment began with as study of the formula y=mx+b, but she added the idea of having the students plot the lines on transparencies thus creating stained glass art (which she would display on the classroom windows). They were encouraged to create a design around the lines they plotted. Mrs. Hartnett insisted on not telling students where to put the lines. They had to do the work themselves. She found that this was difficult for students because they wanted her to sit with them. She says that middle schoolers are afraid of making mistakes, but she also added that “sometimes mistakes are the best thing you can do.” She said the students still have to work on slope, but she felt that by approaching it through art-making, they understood the mathematical concept more readily than they had in previous years. How do we keep track of our district Turnaround Arts priority goals, such as “Increasing Parent Engagement”? Some recent time spent with the schools’ Strategic Arts Plans (SAPs) and meeting with our district’s data lead, has made me more aware of the vague ways we track parent engagement and the need to be clearer about what we mean and want to know while developing systems that can accurately track numbers. Refining these systems will help us develop and share quantitative evidence of how we are reaching and bringing in parents at Turnaround Arts middle schools. After the post-musical congratulations, shared pictures, phone calls, texts, and a debrief between myself and the arts specialists at Roger Williams, the last piece of information the Director of that school’s musical shared with me in came as a response to addressing this issue. Roger Williams didn’t sell tickets to their show, but they did have tickets. They had different color tickets on different nights: red tickets for Friday, blue for Saturday night. They had the exact number of tickets as they had seats in the auditorium. This two-fold tactic both kept their numbers within building capacity and helped them count attendees. Then when the house opened, they made sure they gave a ticket to every person (adult or child) who came through the doors, and then counted the tickets they had left over, the ones they did not give out. With two more school musicals yet to be produced, and realizing that we had a pressing need to measure family attendance at events accurately, this was a first step toward creating a workable system that could be managed easily by each schools’ house managers and ushers. Roger Williams’ process created a baseline number for their first musical, and it can be utilized or improved upon for events in the future. This method will be shared with the other schools, and perhaps they can use it or adapt it for their upcoming shows.